Modern teaching methods for statistics have gone beyond the mathematical calculation of trivial problems. Computers can enable large size studies, bringing reality to the subject, but this is not without its own problems. There are many reasons for students to learn statistics through running their own projects, following the complete statistical enquiry process, posing a problem, planning the data collection, collecting and cleaning the data, analysing the data and drawing conclusions that relate back to the original problem. Individual projects can be both time consuming and risky, as the quality of the report, and the resultant grade can be dependent on the quality of the data collected, which may be beyond the control of the student. 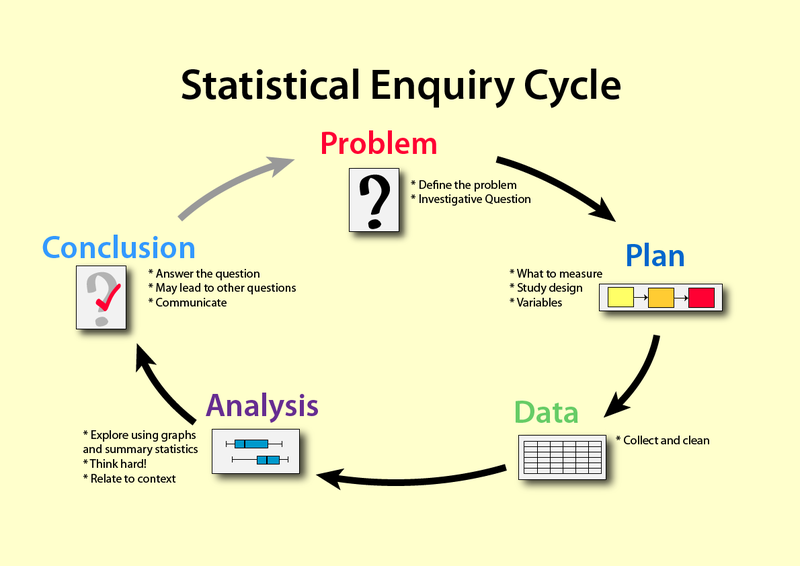 The Statistical Enquiry Cycle, which underpins the NZ statistics curriculum. If students are given an existing database and then asked to sample from it, this can be confusing for student and sends the misleading message that we would not want to use all the data available. But physically performing a sample, based on a sampling frame, can be prohibitively time consuming. The problem here is obvious. It is not ethical to perform experiments on humans simply to learn about performing experiments. An innovative solution: The Islands virtual world. I recently ran an exciting workshop for teachers on using The Islands. My main difficulty was getting the participants to stop doing the assigned tasks long enough to discuss how we might implement this in their own classrooms. They were too busy clicking around different villages and people, finding subjects of the right age and getting them to run down a 15degree slope – all without leaving the classroom. The Island was developed by Dr Michael Bulmer from the University of Queensland and is a synthetic learning environment. 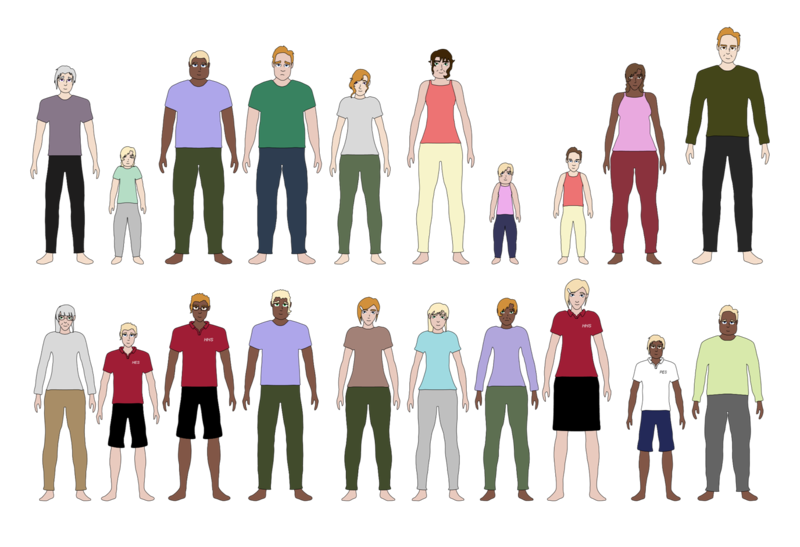 The Islands, the second version, is a free, online, virtual human population created for simulating data collection. The synthetic learning environment overcomes practical and ethical issues with applied human research, and is used for teaching students at many different levels. For a login, email james.baglin @ rmit.edu.au (without the spaces in the email address). There are now approximately 34,000 inhabitants of the Islands, who are born, have families (or not) and die in a speeded up time frame where 1 Island year is equivalent to about 28 earth days. They each carry a genetic code that affects their health etc. The database is dynamic, so every student will get different results from it. To me the one of the two best features is the difficulty of acquiring data on individuals. It takes time for students to collect samples, as each subject must be asked individually, and the results recorded in a database. There is no easy access to the population. This is still much quicker than asking people in real-life (or “irl” as it is known on the social media.) It is obvious that you need to sample and to have a good sampling plan, and you need to work out how to record and deal with your data. The other outstanding feature is the ability to run experiments. You can get a group of subjects and split them randomly into treatment and control groups. Then you can perform interventions, such as making them sit quietly or run about, or drink something, and then evaluate their performance on some other task. This is without requiring real-life ethical approval and informed consent. However, in a touch of reality the people of the Islands sometimes lie, and they don’t always give consent. There are over 200 tasks that you can assign to your people, covering a wide range of topics. They include blood tests, urine tests, physiology, food and drinks, injections, tablets, mental tasks, coordination, exercise, music, environment etc. The tasks occur in real (reduced) time, so you are not inclined to include more tasks than are necessary. There is also the opportunity to survey your Islanders, with more than fifty possible questions. These also take time to answer, which encourages judicious choice of questions. In the workshop we used the Islands to learn about sampling distributions. First each teacher took a sample of one male and one female and timed them running down a hill. We made (fairly awful) dotplots on the whiteboard using sticky notes with the individual times on them. Then each teacher took a sample and found the median time. We used very small samples of 7 each as we were constrained by time, but larger samples would be preferable. We then looked at the distributions of the medians and compared that with the distribution of our first sample. The lesson was far from polished, but the message was clear, and it gave a really good feel for what a sampling distribution is. Within the New Zealand curriculum, we could also use The Islands to learn about bivariate relationships, sampling methods and randomised experiments. In my workshop I had educators from across the age groups, and a primary teacher assured me that Year 4 students would be able to make use of this. Fortunately there is a maturity filter so that you can remove options relating to drugs and sexual activity. James Baglin from RMIT University has successfully trialled the Island with high school students and psychology research methods students. The owners of the Island generously allow free access to it. Thanks to James Baglin, who helped me prepare this post. Here are links to some interesting papers that have been written about the use of The Islands in teaching. We are excited about the potential of this teaching tool. Michael Bulmer and J. Kimberley Haladyn (2011) Life on an Island: a simulated population to support student projects in statistics. Technology Innovations in Statistics Education, 5(1). Baglin, Reece, Bulmer and Di Benedetto, (2013) Simulating the data investigative cycle in less than two hours: using a virtual human population, cloud collaboration and a statistical package to engage students in a quantitative research methods course. Hi – I click on the link to have a look at the islands and it takes me to a login page. There is no option on the page to create a new account. Can you please post a link to access the data for the first time? You need to contact James Baglin for an account. Email james.baglin @ rmit.edu.au (without the spaces in the email address). Hi Dr Nic, Do you know whether Dr. Baglin will allow an entire class of students to get accounts? I usually have about 90 students per semester. I am sure that will be fine. They will probably give you instructions on how to put your students on yourself. This is fascinating. I’m going to get myself an account and give this a try. Thanks! This looks really great – I am keen to hear if anyone has done a successful bi variate investigations or has a good idea for one? This is fantastic Dr Nic. It looks very exciting – I am trying to get myself an account so I can play and plan. I can imagine you doing some great things with this. James has some excellent resources too. I hope you all are enjoying Napier. I am implementing a project this semester for the first time using The Islands, for my Honors students. We’ll see how it goes! That sounds great. Do let us know how it goes.